Sheena Monnin ,Pennsylvania's representative at the Donald Trumps's Miss USA pageant is stepping down because she feels the contest was rigged. A posting on Sheena Monnin's Facebook page dated Monday says she's resigned. 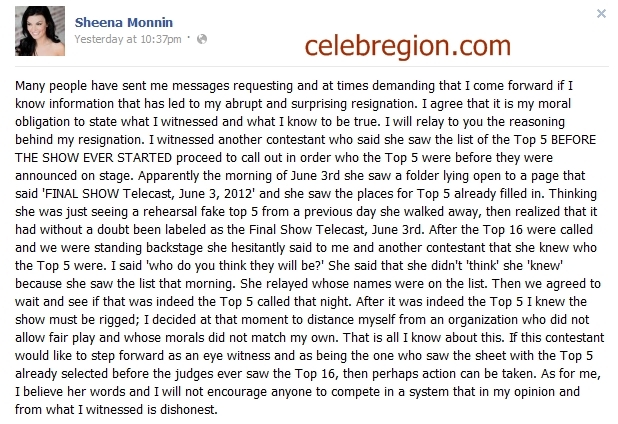 In another post, Monnin claims another contestant saw the list of top 5 contenders on Sunday morning, hours before the show was broadcast. In a statement, the Miss Universe Organization confirmed Ms. Monnin's resignation, but said she cited the organization's policy concerning transgender pageant contestants as her reason for stepping down. "Today she has changed her story by publicly making false accusations claiming that the pageant was fixed," the organization's statement read. Donald trump told NBC that Monnin's accusation were disgraceful and announced that the organization is brining a lawsuit against her . Miss Rhode Island 'Olivia Culpo won the competition last sunday.